It was a 'million-dollar bullet,' a sniper shot delivered from over a mile away. Its victim was no ordinary mark: he was a United States citizen, targeted by the United States government, and assassinated in the Bahamas. The nation's most renowned investigator and forensics expert, Lincoln Rhyme, is drafted to investigate. While his partner, Amelia Sachs, traces the victim's steps in Manhattan, Rhyme leaves the city to pursue the sniper himself. As details of the case start to emerge, the pair discovers that not all is what it seems. 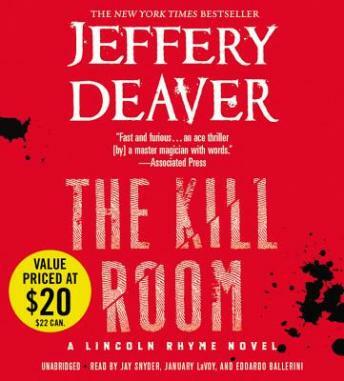 When a deadly, knife-wielding assassin begins systematically eliminating all evidence--including the witnesses--Lincoln's investigation turns into a chilling battle of wits against a cold-blooded killer. The book was typical "Lincoln Rhyme with a few twists. There were red herrings and false trails that kept me from guessing the final conclusion. I enjoyed listening to it and would recommend it to others.